The concept of blogging is no longer new, but this doesn’t make blogs outdated. Instead, they’ve gone mainstream. Blogs are a staple of the internet – and no one would make the mistake of calling the internet irrelevant. People might call the internet a few other things, though – vast, for example. Crowded. Overwhelming. The internet is huge. According to Internet Live Stats, there are now more than 1.5 billion websites. That’s a lot of competition. The good news is that only about 200 million of these are active sites. That’s still a lot of competition, but it’s not quite as bad. To get your site noticed, you need to provide a stream of fresh content that gives people both a reason to check out your website and a reason to keep coming back. Blog writing is how you accomplish this. Is it still called a blog? 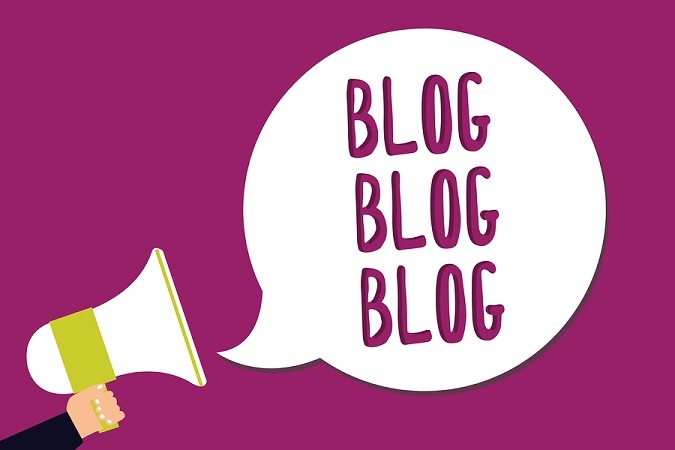 There’s nothing inherently wrong with the word “blog.” At the same time, at least for some people, the word may evoke amateurish ramblings and poorly written text filled with misspellings – hardly the sort of thing you want to associate your business with. Blogs have many uses in both business and hobbies. If you don’t like the associations, you can use other names for your business blog. Call it content, articles, posts, updates, news, tips or whatever else conveys the sense you’re going for. It’s still essentially a blog, with all the web traffic benefits that come with a blog, but it’s one that’s designed to represent your business. How many B2B businesses have a blog? Does it seem like everyone and their mother has a blog these days? Not quite, but it’s easy to get that impression. Blogs are an extremely common part of the internet – because they work. Still, it’s an exaggeration to say that everyone has a blog. According to a survey from the Content Marketing Institute, 91 percent of B2B businesses that responded said they used some sort of content marketing. This could include blogs as well as other types of content designed to attract an audience, such as white papers, case studies and social media posts. Clearly, B2B companies recognize the importance of content. Despite this, only 33 percent of B2B businesses have a blog, according to ZoomInfo. This means that two-thirds of B2B businesses don’t have a blog. The companies that do have a blog have something else as well – an advantage. According to HupSpot, B2B companies that publish at least 11 blog posts a month have approximately three times more traffic compared to B2B companies that publish one or zero blog posts. Given this, it’s not surprising that 43 percent of B2B marketers say that blog writing is the most important type of content. What are key reasons to publish weekly content? Blog writing works because it provides a constant stream of fresh content. New readers will find this content, and current readers will keep coming back to see the latest post. With each visit to your site, readers will be exposed to your brand, and they’ll learn to trust you as an authority. But everything falls apart if the blog becomes inactive. When this happens, readers stop checking in to see what’s new. Traffic plummets. Lead generation drops. A few people might still stumble across old content, but the edge created by blogging becomes dull. Boost user engagement. You want your readers to engage with your content. This could mean leaving a comment, sharing the post or responding to the call of action. By providing new content each week, you’re encouraging active engagement. Rank for keyword phrases. As the internet grows, it’s becoming harder and harder to rank, but weekly blog posts that include keyword phrases will improve your SEO and your organic traffic. Expand the authority, credibility and footprint of your website. You want your business to be seen as a trustworthy source of insights and assistance – the sort of company that others turn to when they need something. Developing this reputation takes work. Weekly blog posts filled with useful information can help you get there. Support the sales pipeline. Marketing and sales don’t need to be at odds. When done right, blog content helps prospective customers move through the buyer’s journey, and it sets the stage for the sales team. Fuel social media and email nurturing efforts. Blogging is closely connected to other forms of digital marketing, and when done well, these different avenues support each other. Weekly content gives you something to post on social media, which in turn helps you keep your social networks active and producing traffic. Likewise, content gives you links to include in your email nurturing campaigns. How long should blog articles be? In recent years, blog posts have gotten longer. There are a few possible reasons for this trend, but one explanation is that people want quality information. Again, the internet is huge, and there’s a lot of competition for readers. Sites that provides posts that come off as basic and shallow won’t succeed. You need to get specific and in-depth, which often – though not always – requires length. According to an article that appeared in Forbes, posts that are more than 1,500 words long get 22.6 percent more likes on Facebook and 68.1 percent more tweets. This significant increase in social engagement shows that long blog posts are effective. At the same time, not all posts need to be long. Some topics, such as quick updates on current events, don’t need to be long. Some people prefer short articles. It’s important to know your audience. If you decide on long posts, make sure you’re breaking them up into easy-to-read sections, with elements like subheads, bullet points and images. According to HubSpot, 43 percent of readers say they skim blog posts. Don’t make it hard for them. Which blog topics are most effective? The modern world is inundated with ads. Many people have learned to tune them out, whether it’s by ignoring billboards, muting commercials and using software to block online ads. This is where content marketing gets its advantage. People don’t block out content. Quite the opposite – they flock to it. Why? Because the content gives them something they want. At least, it should. How can blog articles be repurposed? If you invest in a great blog post, you want to get as much out of it as possible. Don’t post it once and forget about it. Instead, take advantage of these methods to repurpose old content. Use article teasers that link to the complete articles in your monthly or quarterly e-newsletter. Print and format blog posts into PDFs for handouts, which the sales team can give to clients. Link to blog articles as part of your lead nurturing workflows, systems that move leads through the sales funnel. Allow distribution networks to republish them with attribution and a link back to your site. Allow relevant online channels to republish them with attribution and a link back to your site. Post links to your articles in social media. Post articles in LinkedIn using your LinkedIn publishing feature. What are the biggest blog writing mistakes? Expecting instant results. Blogging is about building a reputation and nurturing relationships. It takes time and effort. Not thinking about language. Typos and misspellings can distract from your content and give a bad impression, but using the right language is about more than having good grammar and spelling. You also need to think about the right tone for your audience. Avoid language that’s too simple or advanced for your readers, and adopt a voice that represents your brand. Moving ahead without a plan. Your blog writing strategy should include the type of content you’re going to post, how often you’re going to post it and how you’re going to measure results. Ending without a call to action. You don’t want your blog to look like a giant ad, but you do want it to lead to sales. For this to happen, you need to end with a clear call to action that lets readers know what they can do next. This might include getting a quote, downloading a white paper or contacting a representative. Ignoring meta data. Meta data helps search engines figure out what to do with your site. Creating meta data with relevant keywords is an important part of making sure your blog posts get ranked and get seen. Relying on internal subject matter experts. The biggest mistake that companies make is relying on internal subject matter experts to write articles. While this is a good idea in theory, it rarely works over the long haul. Your subject matter experts are very busy, and writing responsibilities take the back seat to other pressing job demands. When this happens, you’re left with a stagnant, inactive blog. What should you do instead? Hire a blog writing service to keep the process on track. Your internal subject matter experts can route ideas, research and thoughts and the blog writer will craft great articles on their behalf. With this approach, subject matter experts can spend 15 minutes sharing ideas and approving their articles, rather than three hours or more trying to write their articles from scratch. Meanwhile, the marketing team receives original, professional content on schedule every week! Need a reliable, high-quality blog writing service that can handle technical content? Inbound Insurance Marketing can help. We specialize in insurance and financial services, but also write for many other technical B2B industries. Why wait? Learn more about our blog writing services today.